The obvious advantages of the best electric lawn-mowers include ease of use, low maintenance and no toxic fumes or deafening noise. You can’t beat the convenience of starting your mower instantly by pressing a button. And the only maintenance needed for an electric lawn-mower is regular blade-sharpening. So you avoid all the headaches of selecting the correct type of oil/gas, and how much to use. And you don’t have to worry about toxic fumes damaging your or your family’s lungs. So unless you need extra power to cut tough, over-grown weeds, an electric lawn-mower is perfect for large or small yards. ‘Self-propulsion technology’ is a feature of only one of the 5 best lawn mowers reviewed here. It’s a great feature, but for small to medium lawns, a mower weighing no more than 60 lbs. is easy to push over flat ground. When buying an electric lawn mower, the main issue is the battery voltage and re-charge time. Battery-powered mowers give cutting-times between 30 – 60 minutes. And that means a cheaper, low-voltage model can be fine for a small lawn. For areas of one-third of an acre or more, you need a high-volt battery for a one-hour cutting period. And for ongoing lawn-cutting on different sites, you need a fast 40 minute re-charge or a second battery. 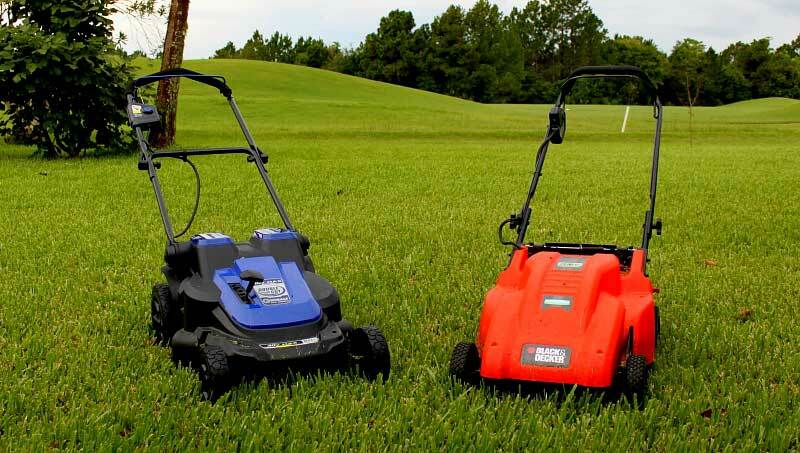 Most electric lawn mowers are sold with one battery, but we’ve included one that includes two. For efficient mowing on larger areas, choose a cutting-blade width of 20/21 inches. 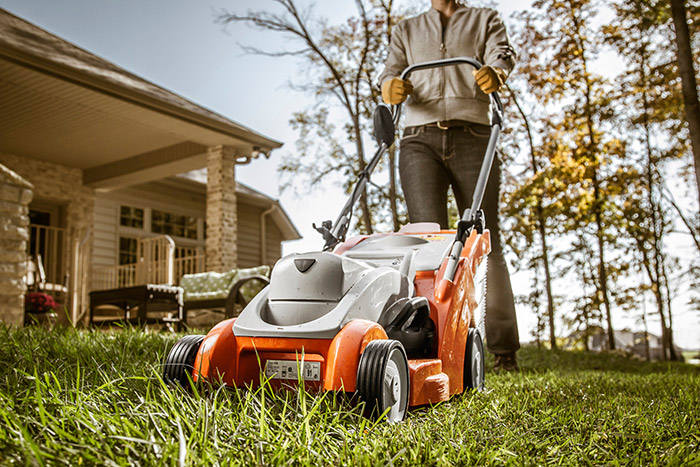 A mower with 7 cutting-heights means faster cutting of over-grown grass. And offers the correct cutting-heights for a variety of different grass types. This guide to the best Battery Powered lawn-mowers makes it easy to keep your large or small yard in perfect condition! Out of the scores of models, we tested until we awarded the title of all-round best electric lawn mower to the Ego LM2102SP model. 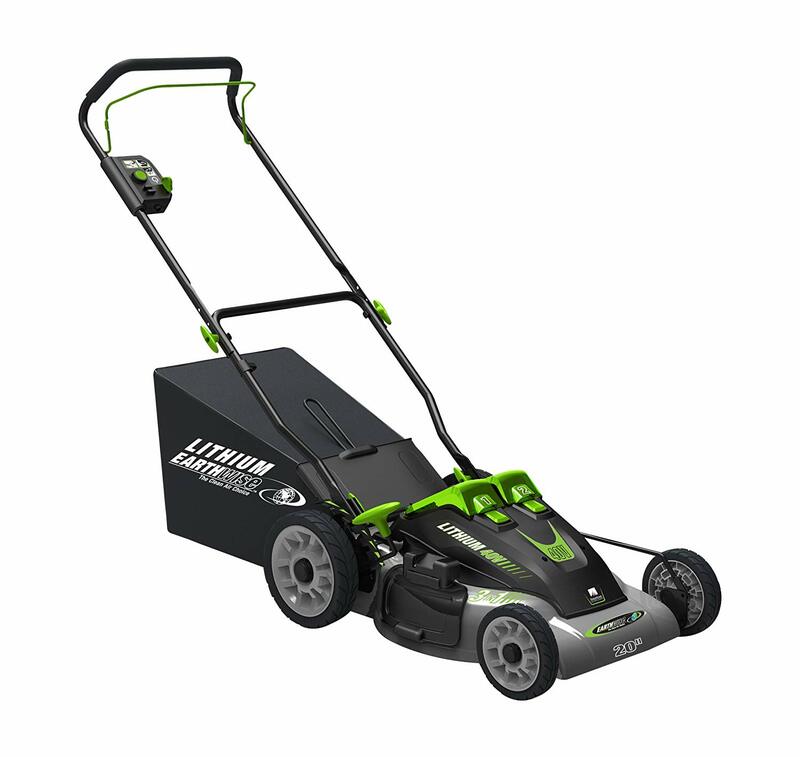 The 56 volt battery lasts 60 minutes, giving you plenty of time to cut a lawn measuring up to about one-third of an acre. This refers to a well-maintained lawn area, not your first go at over-grown grassland. In addition, the lithium-ion battery performs as well as some gas-powered mowers, without belching out gas/oil fumes that harm human lungs! If you need more mowing time, this electric lawn mower can be charged-up and ready to go in just 40-minutes. Just enough time for a lunch-break and much shorter than the 2 ½ hours it takes to fully re-charge an average lawn mower battery! Another advantage is the lighter weight, which is 58 lbs. and far easier to maneuver than other mowers weighing as much as 90 lbs. The 21 inch cutting width greatly reduces the time and energy needed to trim any lawn. And the cutting heights range from 1 ½ – 4 inches allowing you to cut several different types of grass land. With a handy, collapsible handle-bar this lawn-mower is easy to use, and push back to its storage space. If you only have a small lawn, we recommend the STIHL RMA 370 as the best electric lawn mower for small yards. Weighing just 30 lbs. the STIHL is the lightest of our 5 best electric lawn mowers, and works well from a 36 volt battery. You have to buy the battery separately, but the overall cost is quite affordable. A full battery gives you about 40 minutes lawn-cutting time, which is plenty of time to cut a small lawn without re-charging. And when you do need to re-charge, it only takes 30 minutes. Designed to be a convenient model for small lawns, it collects cuttings in a hard-side, plastic bin rather than a bag. We did find this slightly more difficult to empty than a bag, but it was still easy to do for such a small quantity of grass cuttings. The careful design of the Earthwise 60420 makes it our best electric lawn mowers’ value-for-money recommendation. The 20” cutting-width compares well with the Ego above, and the ergonomic grip protects hands from blisters. The 7 cutting-heights give full control over all types of grass-cutting and the battery lasts about 55 minutes. The Earthwise comes with two batteries, which take roughly 2 hours to re-charge, so you can have one on charge while using the other. 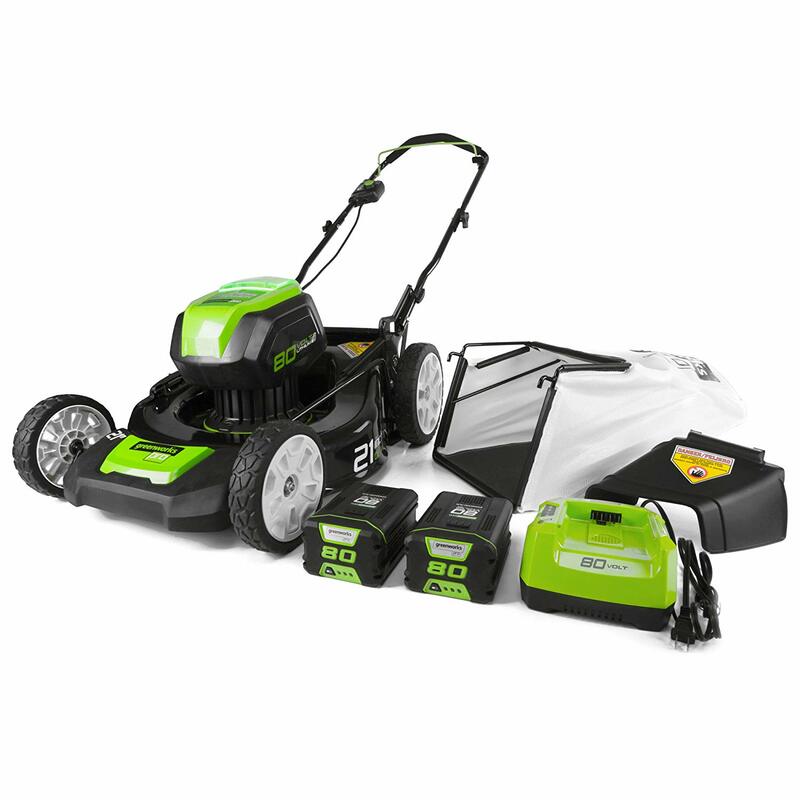 Like most of the best electric lawn-mowers, this is a light-weight model weighing 52 lbs. and the waste-bag holds up to 20 lbs. of clippings. Unlike the more expensive Ego, this unit doesn’t have self-propulsion technology, so you may find it more tiring to push around your garden. The RYOBI RY40180 is the lightweight electric lawn mower we chose as the best electric lawn mower for variable cutting-heights. The 7 cutting positions range from 1 ½” to 3 ¾”, so you always get the correct cut for your grass. And you can cut over-grown lawns faster, with less battery-drain, with this efficient mower. The 20” cutting-width reduces the number of times you need to pass over the lawn, too. You get 40 minutes cutting-time from each charge of the 40 volt lithium-ion battery, which take 1 ½ hours to re-charge. You only get one battery with this mower purchase, so you can’t have a second battery on re-charge, while you work. However, although it isn’t the fastest re-charge time, most lawns can be cut in 40 mins. 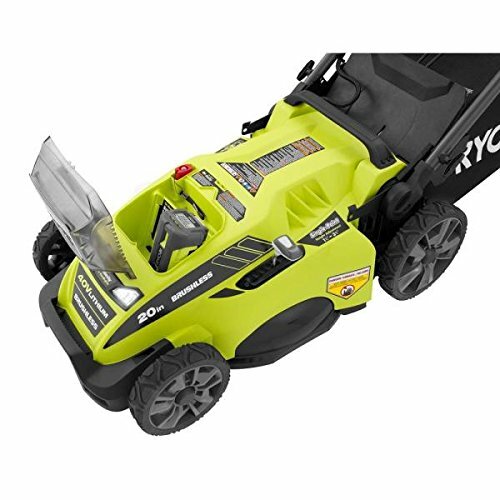 And the battery can be used with any other RYOBI battery-tools you may own. The Green Works Pro includes two batteries and is the best electric lawn mower for fast re-charge and battery efficiency. Like the Ego electric mower, Green Works batteries give 60 mins. of mowing-time for each 30 min. re-charge. However, the Green Works Pro also has the advantage of an automatic, power-adjusting feature that extends battery-life. You can continue to mow while the second battery re-charges, giving continuous cutting-time for large lawns, or professional use. Although the Green Works Pro doesn’t have the ‘easy-push’ of lawn-mowers with ‘self-propelled technology’, it’s very easy to maneuver. And that’s because it’s a lightweight unit with two, over-sized, back wheels designed for smooth movement. And this allows it to move easily over the ground, except over rough terrain. Another ‘professional’ feature is the 21 inch cutting-width – the widest in our 5 best lawn-mowers – and range of 7 cutting-heights. The advantage of 7 cut-heights is you can cut different grass types to the precise length, faster and with less user effort. Compared to corded, electric lawn mowers, battery mowers are slightly more expensive. But users say the extra mobility and convenience that battery lawn-mowers have over corded models is well-worth the extra outlay. Over the whole electric lawn-mower market, battery-powered units remain the most popular option for superior mobility and maneuverability!